A floating school-boat in Lagos. A cooking school for Palestinian women in the occupied territory. A self-organized art centre in the black community of Cape Town, outside the established art world that is characterized by white supremacy. An indigenous village in Alaska that creates collective survival skills for the changing climate. Alternative strategies for art making and societal activism in Venice, a city defined by the bi-annual flow of high art and capital, in an old harbour warehouse. Alternative histories of key moments in political histories. Exhibition structures for self-representation of the perspectives of indigenous people. Media channels that challenge those corrupted by corporate interests. Amplifying the muted voices of oppressed and abused workers in Saadiyat Island in Abu Dhabi. Creative Time, a New York based art commissioning organisation, hosted a 3-day summit in the context of the 56. Venice Biennale. While the biennale, titled All the World’s Futures, echoed and invited projections and reflections of social justice in- and outside the art world, the summit focused on pedagogy and knowledge production as an underlying condition for alternative futures to emerge. A premise for learning, knowing and acting and for any future to emerge, is engagement with the world – and curiosity. Here, too, the dominant approach of the presented projects was not so much to give answers but to produce structures for asking. Ideological certainties were replaced by questions like: What? Who? How? What if? Art in this context not only sheds light on perspectives that are shadowed by mainstream media, but more importantly, works as platform for creative imagination of alternative realities. The core of the programme planning of Checkpoint Helsinki is a question: What is future contemporary art? Rather than binding our projects to any given form, aesthetic paradigm or genre, they grow out of asking of this question again and again, and opening space for different people to answer it in their own ways. All the answers project not only a concept of art, but also an utopia of future societies, and thus contribute to the important discussions on values and policies of today. Participating the Creative Time – The Summit reinforced my belief in the the strategies we’ve taken. Participatory and political approaches might seem trendy, but their emergence also signals a necessity to look for alternative social forms. Even if the biennale and high profile art gatherings take place deep within the walls of the art world, the participating institutions and individuals all work sincerely in their own communities. We – individual artists or art organizations like Checkpoint Helsinki – don’t make art for the art world. We make art with the world. And it’s good to know that we’re not alone. PS You will find the livestream of the summit here. In the first ever newsletter we send out, I would like to share the image I grew up with. 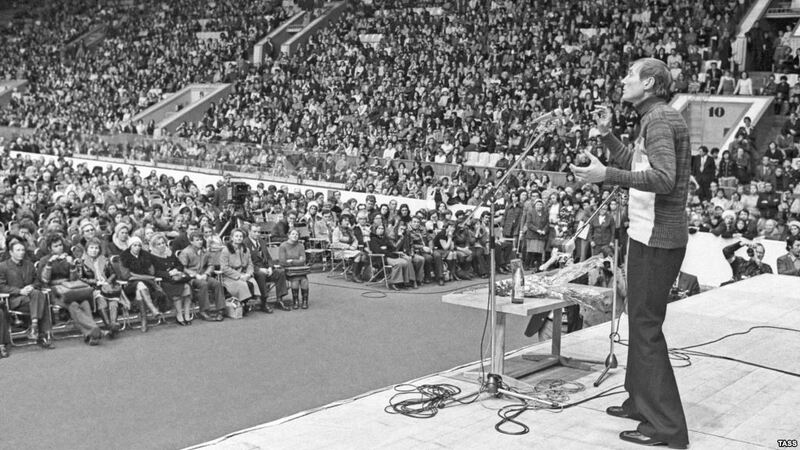 In this image, poet Yevgeny Yevtushenko reads his poetry in front of a stadium full of people. The year is 1978. Notice how there is no multimedia show. There is no projectors, streaming his image onto the background. People in the back rows probably can’t make out his face, it’s so far. But they can see each other. They can see how many they are, coming from a diversity of backgrounds and social circles. They can see, quite simply, that despite all the differences, there is something they all share. Thousands of people showed up for a poetry reading at a stadium, on a cold day. Notice how women in the front row kept their coats on. Every time, it reinstalls my faith in art’s potential to create exceptional spaces, defying the logic imposed by whatever mainstream discourse we have on the agenda at any given historical era. Today, it is more important than ever to search for these spaces that expand our understanding of what is possible, that create temporary communities and long-lasting connections. We have just started our third year at Checkpoint Helsinki and I am looking forward to sharing some exceptional moments with you, a diversity of outstanding artistic visions and curatorial approaches. I am curious to see what kind of shared space we will create together.